Recently I picked up a few envelopes that were relevant to Long Beach. I was in Victoria and, by chance, saw a small notice for a stamp show. This is not the sort of event I regularly frequent (or ever do), but I think I might just start. 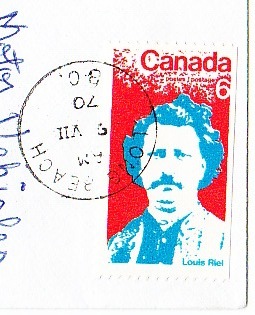 I was less interested in the stamps (although I do actually like stamps, they very much relate to my interest in art and history), but I hadn’t thought all that much about cancellation marks. I started up a conversation with one of the dealers and he handed over a box of letters from the west coast. I was actually looking for the letters, but that’s not what’s available. Only empty envelopes here. What I did end up walking away with were two envelopes that were sent from Long Beach post offices that no longer exist. This first one is from the Tofino M. P. O., the military post office that would have been at RCAF Tofino, which was actually at Long Beach. (Thus the reason we have such a large airport for a region with a relatively small population.) Tofino MPO 1122 was open just over a year, from August 22, 1944 to September 28, 1945. This second cancellation is from the Long Beach post office, which was recorded as being opened and closed three times. The first opening was from 1943-05-01 to 1946-05-16. The “postmaster” was Coast Construction Company, which was the company charged with preparing the land for the coming RCAF Tofino. They had a huge camp in the area close to today’s Grice Bay boat launch (McLean’s Point) so the post office likely served most of those men as well as the few residents who lived at Long Beach during that time. Two months after this office closed, Hazel Donahue became the postmistress. Hazel and her husband Jim lived on Long Beach from 1933 to the mid-1950s. Hazel ran the post office from 1946-07-01 to 1947-05-01. It’s unclear why it closed and where people went for mail after that (likely via Tofino or Ucluelet post offices). I was delighted to find that the last postmaster was Archibald Abbott, who re-opened the post office on 1965-10-28. Delighted because the house I currently live in was part of Archie Abbott’s store at Long Beach. (It was near today’s Kwisitis Centre, formerly the Wickaninnish Interpretive Centre, formerly the (original) Wickaninnish Inn.) I wrote about how I came to own Archie’s house here. Do you have any letters or postcards that were sent to or from Long Beach and area? If so, I’d love to hear from you! I love how the cancellation marks piqued your interest and you continued your research–fascinating history–thanks for sharing! Looking at that address now (I was too young at the time to be concerned about such things), it looks like airbase mail was probably picked up at the Ucluelet post office by a base courier and taken back to the airbase for distribution. That makes sense, because mail – and pretty well everything else arriving in the area (including automobiles) came in on the Uchuck (II or III) on its scheduled trips between Port Alberni and Ucluelet. When the airbase closed down in mid-1957, my father got a post office box in Ucluelet, and we had to go there to pick up our mail for the rest of our time at the beach. Thanks for leaving a comment, Patrick. So great to hear your stories.